Author/s : Dr. Stephen Oluwole Adejoro D.V.M / International Poultry Consultant & Contract Head of Research and Marketing, Zartech Limited, Nigeria. Was weight of Broiler or pullet DOC mentioned in this article? surely No! I dont think up to 25million people are directly or indirectly employed through poultry in Nigeria. 612 Metric tons of chicken from 29 million broilers??? Dan what exactly is your definition of poultry and the poultry Industry? have you considered the various producers of input into the poultry industry? such as the farmers producing the supply maize , soya, sorghum ,Palm Kernel cake, their transportation and the distributors of wheat offal and brewers grain all supplying the poultry industry and earning their living from there? Dan dont forget the manufacturers of poultry equipments and cage producers in Nigeria or even the engineers that are recently fabricating feed mill equipments slaughtering machines and oil crutchers plus the various work force in that system ,which Industry would you place them please? I shall in the due course study the knity of Dr Adejoro's contribution. Much as we are aware that we lack data base or relevant information on figures, however, his estimation of those involves in the whole poultry value chain is a gross underestimation. If Mr Dan Musa have been a keen player in the industry, he will be very quick to accept this fact. Poultry value chain remains the largest of all other commodities in the agricultural sector. A very interesting article. 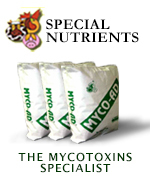 Whilst I am in no doubt that mycotoxins contribute to the on-going problems, one should consider a much wider range of nutritional solutions to really start to make improvements. With our extensive experience in West Africa, we are aware that nutritional knowledge and training needs to be seriously improved. Use of up to date formulation tools / nutritional standards will improve industry performance (as all levels, from farm, to hatchery, to meat sales), and at the same time improve profitability. A single, simple point; reducing unneccesary feed crude protein by 1% will reduce water consumption by 1.5%. Provision of adequate energy and digestible amino acids will enhance growth rates and reduce FCR. De facto this means the use of higher quality raw materials than is currently the norm in Nigeria. Evonik have been investing in training and working with Customers to bring to the Nigerian poultry industry the very best in nutritional knowledge; and this we will continue to do. Thank you sir for this discussion. My dear colleagues in the academia, what are we doing to mitigate the effects of climate change in the livestock industry. Dr Adejoro has highlighted good recommendations. Since we are not yet very good in nanotechnology, we should look at nutrition option as suggested by Martin Smith from Evonik. My ongoing research work shows a very high level of mycotoxin contamination of poultry feeds sampled in Lagos, Nigeria. I think it will be good to have Martins in Nigeria for the training program. I am ready (like many other) to participate. Great topic, and one that deserves much attention. I agree with Martin as well, so how can we all help the industry in Nigeria? While we are dealing with mycotoxins, hatchery issues, etc. in other areas as well, scientists and industry professionals have data that I believe would be great to employ in Nigeria. For example, a group out of Hebrew University in Israel does much work on heat stress in broilers where they found heat stressing the chicks and even the eggs, leads to an animal that can better tolerate temperature swings and long periods of high temperatures. Data such as this and hat we know on mycotoxicosis should be relayed to Nigeria as Martin's group does. I am a gut health scientist with a molecular background currently in the poultry feed additive industry and I think that Martin's program is great and I would be willing to help with what I could if there is to be a program set up. important to know is the groundwater dept and temp. in the foreseen area,s. according to that we can drop temp. arround 5-12 degrees. so when we can help,just let me know. I consider it appropriate, rather, to influence the mitigating factors of the caloric effect; the use of osmolytes, especially Betaine. Betaine, also known as trimethylglycine, is an amino acid derivative, that appears in a natural form, with three reactive methyl groups and a dipolar structure. In addition to the donor function of methyl groups, anhydrous betaine is also known as an osmotic regulator; which can exhibit multiple positive effects in birds subjected to heat stress. Among the potential benefits of its inclusion in poultry foods, are the reduction of choline, the reduction of fat in meat and cellular osmoregulation. As a donor of a methyl group, it enables its labile methyl group for the synthesis of several metabolically active substances such as creatine and carnitine. Betaine promotes intestinal microbiota against osmotic variations and improves microbial fermentation. I conclude by noting that supplementation with anhydrous betaine improves intestinal integrity in both healthy and coccidial infected birds (Kettunen et al., 2001) and that it is feasible to replace 10% of the methionine content of the food with betaine, although this cannot replace methionine to synthesize protein. Dr. Stephen, same here, thanks for your comment. Would you like to discuss about this topic: Poultry Industry in Nigeria and Climate Change Implications?